2x2 Actual Size - 23-5/8" x 23-5/8"
2x4 Actual Size - 23-5/8" x 47-5/8"
Perfect for both commercial and residential applications, these uDecor Tiles are constructed from .03" vinyl. Their lightweight and durable material make these tiles easy to install. uDecor tiles are also waterproof, which means they are washable and will not stain from mildew or humidity. These tiles are a perfect choice for anyone who wants to add that designer touch at an amazing price. These are designed to fit standard 15/16" - 1" T-bar Ceiling Systems. If you have a 2x4 drop grid, use our easy to install grid dividers easily convert your system to fit these 2x2 tiles. Our uDecor tiles are incredibly lightweight, which means there is less strain and stress during the installation process. Also, you can easily move them if you ever have to access the backside of the grid. These tiles are flexible which makes installation a breeze and ideal for areas with minimal clearance, unlike traditional mineral fiber tiles that easily break, crumble, or chip. Slide them into the suspension system alone or beneath an existing tile. You can also install these directly to your ceiling using the glue up method, just grab construction adhesive such as Red Devil General Purpose Construction Adhesive. Cutting ceiling tiles has never been easier - scissors or tin snips get the job done best. Say goodbye to those nasty water stains and bowed ceiling tiles from water damage. uDecor tiles are virtually impervious to water and mildew, giving you peace of mind that your tiles will look great for many years to come. Our uDecor tiles are durable. Made out of high-quality pvc, these are sure to stand the test of time. With water and a quick wipe down, your tiles will maintain their new and fresh look. This is another benefit to PVC tiles compared to porous mineral fiber tiles. Enjoy the appeal of clean, beautiful, long-lasting tiles. The Cathedral tile is a beautiful style that is suited for both Direct Mount or Grid application. The 12 inch pattern makes it well suited for both small and large spaces. If installing in a ceiling grid, make your grid look as elegant as your tiles by painting your grid or using Our Designer Collection Grid Strips. If you are planning to direct mount these to your ceiling, you will love the way that they overlap. No seams to conceal, so there is no need to buy grid strips. For direct mount applications, save a trip to the store by purchasing our Red Devil brand Direct Mount Adhesive. If you would prefer to pick up something locally, PL Premium Advanced (Loctite brand) works great. Since your ceiling will more than likely have partial tiles at the perimeter, you will have to cut your tiles to size for those areas. This can create a gap running into the wall with some styles. Since the Cathedral style has a very minimal projection, many of our customers do not find the need for a border tile. Should you decide you would prefer one, our Designer Border Tile are the perfect remedy. Materials used in the construction of the tile(s) are 100% waterproof. Tiles have been tested in accordance with ASTM 84e and scored a Class A rating for flame spread and smoke generation. ProCeilingTiles.com guarantees that your ceiling tiles will be free from manufacturing defects for a period of five years from the date of purchase. This warranty does not cover problems caused by improper installation methods. It covers only installations done in accordance with the installation and handling instructions available on this website. This warranty does not cover damage caused by improper maintenance or by use contrary to our recommendations. This warranty does not cover normal wear and tear or shade changes due to exposure to smoke, fumes, leaks, or abuse. This warranty does not cover labor charges. This warranty applies only to material purchased by you, the owner, in unopened cartons for your own use and not for resale. This warranty is not transferable and applies to the original purchaser only. Please Note: ProCeilingTiles cannot guarantee that the published surface burning characteristics, fire resistance ratings, acoustical performance, dimensional stability / sag, or light reflectance will remain as stated if the tiles are painted. Painting will void this warranty & any certification(s). Painting will void UL approval for installation under fire suppression sprinkler systems. This warranty does not cover differences between photographs and actual products purchased. There are no implied warranties, representations or conditions, except those required by statute, and they shall not extend beyond the term of the warranty applicable to your purchase. We exclude and will not pay any consequential or incidental damage, loss or expense. This warranty gives you specific legal rights, and you may have other rights which vary by jurisdiction. If a manufacturing defect does occur within the terms and conditions of this warranty, you will be supplied with new material to replace the defective parts, subject to inspection and approval by ProCeilingTiles. The replacement materials will be of the same or similar design and quality. The manufacturer of our Pro-Series tiles guarantees that your tiles will be free from manufacturing defects for a period of twenty-five (25) years from the date of purchase. This warranty does not cover problems caused by improper installation methods. It covers only installations done in accordance with the installation and handling instructions available on this website. This warranty does not cover damage caused by improper maintenance or by use contrary to our recommendations. This warranty does not cover normal wear and tear or environmental impacts such as sunlight or finish color changes due to exposure to smoke, fumes, leaks, abuse, or acts of God. This warranty does not cover labor charges. This warranty applies only to material purchased by you, the owner, in unopened cartons for your own use and not for resale. This warranty is not transferable and applies to the original purchaser only. Note: We cannot guarantee that the published surface burning characteristics, fire resistance ratings, acoustical performance, dimensional stability/sag, or light reflectance will remain as stated if the tiles are painted. This warranty does not cover differences between photographs and actual product purchased. We strongly recommend that all customers request and evaluate samples prior to purchase. If a manufacturing defect does occur within the terms and conditions of this warranty (25 years from date of purchase), you will be supplied with new material to replace the defective parts, subject to inspection and approval by the manufacturer. uDecor.com guarantees that your LED Light Panels will be free from manufacturing defects for a period of five years from the date of purchase and preform as expected during that time. uDecor guarantees that your LED drivers will be free from manufacturing defects for a period of three years from the date of purchase and will operate within specifications. This warranty does not cover problems caused by improper installation methods. This warranty does not cover normal wear and tear or damage due to exposure to smoke, fumes, leaks, abuse, or acts of God. This warranty does not cover labor charges. This warranty applies only to material purchased by you, the owner, in unopened cartons for your own use and not for resale. This warranty is not transferable and applies to the original purchaser only. The manufacturer of our Metal and Vinyl Suspension Systems and clip on grid covers guarantees the product(s) will be free from manufacturing defects for a period of twenty-five (25) years from the date of purchase. This warranty does not cover problems caused by improper installation methods. This warranty does not cover damage caused by improper maintenance or by use contrary to our recommendations. This warranty does not cover normal wear and tear or environmental impacts such as sunlight or finish color changes due to exposure to smoke, fumes, leaks, abuse, or acts of God. This warranty does not cover labor charges. This warranty applies only to material purchased by you, the owner, in unopened cartons for your own use and not for resale. This warranty is not transferable and applies to the original purchaser only. Note: We cannot guarantee that the published surface burning characteristics, fire resistance ratings, acoustical performance, dimensional stability/sag, or light reflectance will remain as stated if the tiles are painted. The manufacturer of our Metal and Vinyl Suspension Systems and clip on grid covers guarantees the product(s) will be free from manufacturing defects for a period of five (5) years from the date of purchase. This warranty does not cover problems caused by improper installation methods. This warranty does not cover damage caused by improper maintenance or by use contrary to our recommendations. This warranty does not cover normal wear and tear or environmental impacts such as sunlight or finish color changes due to exposure to smoke, fumes, leaks, abuse, or acts of God. This warranty does not cover labor charges. This warranty applies only to material purchased by you, the owner, in unopened cartons for your own use and not for resale. This warranty is not transferable and applies to the original purchaser only. Note: We cannot guarantee that the published surface burning characteristics, fire resistance ratings, acoustical performance, dimensional stability, or light reflectance will remain as stated if the grid is painted. If a manufacturing defect does occur within the terms and conditions of this warranty (5 years from date of purchase), you will be supplied with new material to replace the defective parts, subject to inspection and approval by the manufacturer. uDecor, Inc. provides a LIMITED LIFETIME WARRANTY to the original purchaser of our polyurethane products. This LIMITED LIFETIME WARRANTY provides that the polyurethane material will be free from manufacturer defects in material and workmanship under normal and expected use. This warranty does not encompass all of the products sold by uDecor, Inc. and is exclusive to our polyurethane products only. Other products may carry their own manufacturer's warranty. Call us at 1-877-550-0600 for details. Our Wood Ceiling Tiles are backed with a 3 year warranty which guards against fading, warping, or yellowing. Our Imagination Series Ceiling Tiles are backed with a 10 year warranty which guards against fading, warping, or yellowing. This Item is warranted to be free from defects in materials or workmanship for a period of one (1) year from the original date of purchase under normal use. Within the warranty period, we will repair or replace the product at our discretion. This warranty extends only to the original retail purchaser, and excludes any damage to the product resulting from accident or misuse. This product is not covered, when used in a commercial environment, for which it was not intended. The above warranty is complete and exclusive. The warrantor expressly disclaims liability for any special, incidental, indirect, or consequential damages in connection with the purchase or use of this product or costs over the original purchase price. Any implied warranties arising by operation of law shall be limited in duration to the terms of this warranty. This warranty gives you specific legal rights and you may have other rights, which vary by jurisdiction. At ProCeilingTiles.com, we know that projects take a while, and sometimes plans change. That's why, in most cases, we give our customers a 90 day grace period to return products. The products must be unused/new and in their original boxes. We are unable to replace items have been modified or installed, so please review all the contents of your shipment for damage and to verify that the items received are correct. Damaged items, or items shipped in error, that are not modified will be replaced promptly. When returning products to Proceilingtiles.com the customer is responsible for the shipping cost back to us. Your refund equation is: (Price for Product + Tax) - (Actual shipping cost back to us) = Your Refund. Example: You paid a total of $ 100 for products from ProCeilingTiles.com. You had used a coupon for free shipping when placing your order. Since shipping isn't truly free for us, the original actual shipping amount is deducted from your refund. So, if actual shipping cost was $ 8.00 (hypothetical cost) and you returned all of the products, you'd receive a refund amount of $ 92.00. If you had paid any sales tax when placing your order (CA and KY residents only) that would also be refunded in full. Custom products do not qualify for a refund if returned. Custom products include, but are not limited to, the Imagination Series and Custom Tile categories. In the event that a ProCeilingTiles.com order qualified for and received a quantity discount, special consideration must be taken when accepting a partial return of the specific product that qualified for the quantity discount. If a customer's request to return a specific amount of product breaks the initial quantity required to qualify for a discount, it is possible that the customer will not receive a refund for the returned items to ProCeilingTiles.com. This is because we have extended a generous discount for a bulk buy, which may no longer applicable if a portion of the product is returned. Bill purchased 400 of a particular ceiling tile which cost $ 4.25 per tile (a $ 0.74/tile discount when purchasing 400 or more). His order also qualified for free shipping and he was not subject to sales tax. The order total was $ 1700.00. After Bill finished his project, he decided that he did not need 30 of his tiles, and he wishes to return them. We must treat Bill's order as if he originally purchased 370 ceiling tiles, which means he would have not qualified for the $ 0.74 per tile quantity discount. If Bill had only purchased 370 tiles, the tiles would have cost $ 4.99 per tile and his order total would have been $ 1846.30. In this particular case, Bill's new order total ($ 1,846.30) would actually be more than what he originally paid ($ 1,700.00). While we wouldn't charge Bill the difference when returning the tiles, we also would not be able to provide any refund. It would be better for Bill to keep the tiles and save on the return shipping. When and how will a customer be refunded? If products are returned within 90 days of the purchase, the customer's credit card will be refunded electronically. If products are returned toward the end of the 90 day period, and the refund does not take effect within 90 days of the purchase date, the refund will be issued by check and sent by USPS. Returns may take up to 2 weeks to be processed. Please be careful when packaging items for returns. You will be responsible for damage incured during shipping, so please package the items accordingly. Retain the paper work that the shipping company gives you, especially the tracking number. Remember, you will be responsible for the items until we receive them. To return any product(s) please call us at 1-855-376-5060. You may also inquire information via email at returns@proceilingtiles.com. Our SoniGuard insulation is specifically built and designed to work above our ProLite Series and can be purchased from our website. If your tile design is flat on the back, you can slide these tiles into place under your existing tiles, leaving the existing tiles to bear the weight of your insulation. You can place small furring strips that lay across the top of the grid to use as support for insulation. 1x1 or 1x2 wood strips provide enough support for insulation. You can push your existing tiles up out of place and turn them slightly to rest on top of the grid system. This would allow the insulation to rest on top of these tiles. You can secure the insulation to the "real ceiling" of your space, leaving the tops of the tiles clear of any need to support weight. Once you have determined how you tiles will be installed (empty grid, under existing tiles, existing tiles pushed up) it's time to get started. Place all of the full sized tiles first, leaving the border and partial tiles for last. Having all the full sized tiles in place will push the grid into its natural position. If you cut and install border and partial tiles first, you may find that they are the wrong size once all the other tiles are in place. Use a tape measure or straightedge to measure the size your tiles need to be. Transfer those measurements to the back side of the tile with a pencil or grease pencil. Our ProLite Series is very easy to cut with regular household scissors. Follow your lines for a nice neat finish. You can also use a razor knife if needed. In many homes grid mounted lights are very popular. You should choose a tile design that has a large enough flat area for the light bezel to lay flush once installed. You should also choose lights that have grid mounting brackets so that the weight of the light is supported by the grid system and not the tile. Place your light fixture and tile in the grid system. Adjust the light to its final position and mark this on the backside of your tile. Use the appropriate size template to mark the hole in the tile. Many times the light bezel or a roll of tape will be close to the correct size. Use scissors or a razor knife to cut the opening. We do not recommend can light fixtures that are not designed for direct contact with insulation nor do we recommend using halogen lighting. Unshielded fixtures, especially those using halogen lighting represent a risk of fire or melting the tiles. Our ProLite Series tiles are designed not to be affected by temperatures up to 120F. In some cases there may be localized ceiling and tile temperatures that exceed the tiles designed operating temperature. This can happen around heat registers, above stoves and ovens, around high temperature lighting, and in environments that intentionally have higher than normal temperatures, like heat spas, and Hot Yoga/Bikram studios. Contact us if your space may be subjected to any of these conditions. These self adhesive strips/tape are designed to cover up the ceiling grid. Each strip is 2 feet long with an attractive embossed pattern and the grid tape is sold in 100 foot long rolls. The adhesive on the back is to aid with installation, and IS NOT a permanent adhesive. Small dabs of tile adhesive should be applied to the back of the strips or tape. A small dab at each end, and 2 dabs spaced equally in the middle of the strip are adequate to permanently secure the strip to the ceiling. The ceiling grid tape should have a small dab of adhesive applied every 6 inches. The adhesive backing will allow for the strip to stick to the ceiling long enough for the tile adhesive to cure. Failure to use tile adhesive may result in the failure of the strips or tape to adhere to the ceiling. Approximately 1 Tube of adhesive per 125 strips (250 linear feet) is needed. We recommend Red Devil General Purpose Construction Adhesive (available here) or Loctite Power Grab All Purpose Adhesive (available locally in most big box stores). Make sure your grid system is clean before starting application. Rubbing alcohol or 409 work really well to remove any dust or oils. For best results, make sure the temperature in the room is between 60 - 80 degrees Fahrenheit and low humidity. Do not peel the backing off until you are installing the strip. Any contamination of the back side of the strips will compromise the performance of the adhesive. The decorative strips should be butted up to one another. Do not overlap the strips. Make sure to always start at the same end of the strip. You may have to trim each strip slightly, so always put the strip in place before peeling off the backing so you can see if any needs to be trimmed. Take your first strip. The dot at the end of the strip should be directly over the intersection of the 4 tiles. Once you have the strip lined up, peel the backing from the self adhesive and apply small dabs of tile adhesive to the back of the strip (see above). Run all the strips one direction first. Finish off by installing the strips that run perpendicular to the tiles. Each strip will need to be trimmed, so keep a pair of scissors or snips in your pocket and cut off the dotted end. Start in a corner and work one direction. Apply small dabs of adhesive every 6 inches. Trim the tape to fit when you reach the end of a run. Finish of by covering the remaining cross T's (shorter gid sections). Using the same glueing technique as above. Trim the tape to fit the space exactly. Do not overlap the tape in any areas. We recommend adhesive when installing our tiles. Although stapling is an option, adhering tiles with adhesive is the recommended method, yielding the most favorable results. (Staples can crack the tiles). We recommend "Red Devil General Purpose Construction Adhesive" available here. Install ceiling tiles directly to ceiling using an approved adhesive. Verify on the adhesive of your choice whether it will work for both the ceiling tile material and the material to which it is to be adhered. 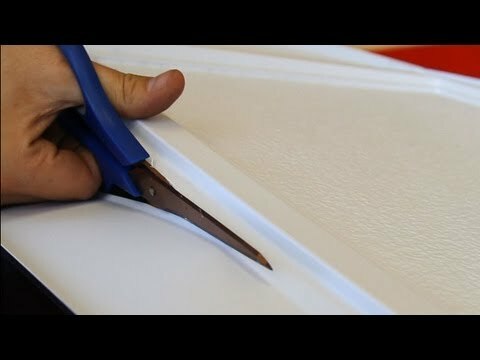 Install ceiling tiles directly to ceiling using adhesive. Furring strips can be used to mount the tiles to. This method is a great solution for ceilings that are not quite perfectly flat and would require a lot of work to fix. Furring strips can be leveled with shims when installing, giving a nice flat area for the tiles to adhere to. The furring strips should be spaced out the width and length of your tile, minus any overlap that may be required. If you are installing 2x4 tiles, we recommend putting up furring strips in a 2x2 pattern so the middle of the tile has something to adhere to. Ceiling tiles should never be applied directly to popcorn ceilings. The ceiling tiles need a flat, even surface to be applied to. There are several ways to create an appropriate surface. You can remove the ceiling texture, add a new layer of drywall over the existing surface, or install furring strips. If you decide to remove the existing texture, it would be a really good idea to test the material for asbestos before going to work. The process of removing the material is messy and time consuming and depending on your local laws, you may need to have a licensed removal contractor do the work. Please check into it before you start removal. Your surface needs to be smooth, clean, and dry. Test out your adhesive and tile combination in a small area before committing to doing the whole ceiling. Take the time to plan your layout. One of the most important things to know is that not every ceiling tile is exactly 2ï¿½x2ï¿½ or 2ï¿½x4ï¿½. Most tiles are slightly smaller so that they are versatile; working for both glue-up and drop grid applications. Be sure to check the size of your tile before laying out your ceiling. If you plan on using grid strips to cover the seams, be sure to check the spacing needed between the tiles. Use a grid strip to verify the space needed to allow the grid strips to lay flat. Place a few tiles on the floor and check the size and overlap. The overlap length can vary depending on the tile design and/or personal preference. Note: The thickness compounds where 4 tiles overlapping tiles meet for the Legacy and Designer tiles. With careful planning, you can trim 2 or 3 tiles to minimize the thickness. This step is also a personal preference. For most installers, the ceiling height makes the overlap thickness unnoticeable. Knowing the actual size and overlap of the tile is very important for direct mounting. You will be marking a grid on the ceiling to keep everything nice and straight. If you are off by only 1/8 of an inch on each tile, after 8 tiles you will be off a whole inch. Be as precise as you can with your measurements. Use grid paper and map out your ceiling. Indicate the position of lights, vents, and any other fixtures or obstructions on the ceiling. The location of these obstacles will determine your layout and overall look of the finished ceiling. Make sure you take the border into consideration when laying out the tile pattern. A larger border is often preferred over a small one. Use your drawing to plan an even border around the room. Note: If the ceiling tile you have chosen has a large amount of relief, you may want to consider the use of a flatter border tile in the spaces where there are lights, vents or other obstructions in the ceiling. Tiles with a significant relief design may preclude the use of them when confronted with a surface mounted accessory. Consider the main, most visible area of your space as well as the longest runs of tiles. These are usually the lines you want square to your starting wall. At some point, you will need to pick a wall to start from and use it as the base for your lines. Most rooms are not square and many times tile layout is a compromise of room shape and border tile size needs. Once your pattern has been decided, use a chalk line to snap your rows. Make sure to space your chalk lines according to your size of tile. If you are overlapping tiles during installation, you will have to reduce your line spacing to account for the tile overlap. Note: Both of these layouts are out of square by the same amount, only the size of the border tiles are different. The layout on the right shows how much easier it is to spot the imperfection in the alignment. The smaller the border tile, the greater it will magnify how out of square a room is. Make sure all your surfaces as well as your hands are clean. Any oils on the ceiling or tiles, even the ones from your skin, can affect the performance of the adhesive. Latex gloves are a great option during the installation process, keeping oils off the tiles and keeping your hands clean of adhesive. Take your first tile and apply a bead of adhesive all the way around the perimeter of the backside of the tile. Make the bead 1/8" to 3/16" in size. If the tile center lays flat on the ceiling, add a 4" "X" to the center section with adhesive. If the tile has a design where only a few areas touch the ceiling, place dabs of adhesive on those sections. Keep a damp towel handy to clean up any adhesive that may seep out. Gently place the tile close to its final location next to your chalk lines. Lightly press the tile to the ceiling as you slide it into position. This lets the adhesive spread out and smear a bit. Once you are satisfied that the tile is in place, firmly press the tile to the ceiling, rubbing out any bumps in the adhesive. Use the same gluing technique as the first tile. Place the second tile next to your first one, overlapping the edge(s) by your predetermined amount. Your grid should have marks where your tile edge should be. Continue to place full sized tiles, adjusting as necessary, to remain lined up on your grid lines. Use the same gluing technique as the first tile. Place the second tile next to your first one. The edges of each tile should be touching. Donï¿½t press the tiles together with force. Use the Grid Strip to confirm you are placing the tiles with the correct spacing. Continue placing full sized tiles adjusting as necessary to remain lined up on your grid lines. For non-overlapping tiles, creating a small space to remain on your layout is okay. These gaps will be covered by the Grid Strips when finished. Measure the open space from the installed tile to the wall. Make sure to take measurements at each end of the space, as the measurements are often different. Make sure the tile is facing the correct direction. Transfer your measurements to your border tile and cut it. Grid strips are designed to cover up the seams between non-overlapping ceiling tiles. Each strip is 2 feet long and most designs come with an embossed pattern. The adhesive on the back is to aid with installation and IS NOT a permanent adhesive. Small dabs of tile adhesive should be applied to the back of the strips. A small dab at each end and 2 dabs spaced equally in the middle of the strip are adequate to permanently secure the strip to the ceiling. The adhesive backing will allow for the strip to stick to the ceiling long enough for the tile adhesive to cure. Failure to use tile adhesive may result in the failure of the strips to adhering permanently. Make sure your tiles are flat and any adhesive that has oozed out between the cracks has been cleaned up. If your tiles have been up for a while, take some time to clean the area that the strips will be applied to. Rubbing alcohol or 409 work really well to remove any dust or oils. The decorative strips should be butted up to one another. Do not overlap the strips. Make sure to always start at the same end of the strip. You may have to trim each strip slightly, so always put the strip in place before peeling off the backing so you can see if any trimming is needed. ELEGANT, BEAUTIFUL AND EASY TO WORK WITH. The Cathedral Ceiling tile (white) has made a remarkable change in our basement apartment. Everyone comments on the beauty, design, and how it has lifted up the appearance of our basement. Highly recommended! Slightly difficult to cut because of the 3D quality but overall a great tile. Was used to glue to the ceiling. This was my first attempt at ceiling tile installation. We purchased the adhesive from a nearby home improvement store. The adhesive was Fast Grab which comes in a one gallon or 3 gallon bucket. The tile was easy to install. It totally changed the room. The ceiling tiles look great and it made a large improvement to each room in my 100 year old home. I will be doing more later on. These ceiling tiles really transformed our bedroom that had a drop ceiling grid. The design is beautiful and elegant. They are durable and easy to install. We are excited to begin working on the rest of the house! Thanks so much to your support team for answering our many questions! Free shipping to boot! LOVE this company! While they look good, the center of the tile drops down lower than the edges that are supported by the grid. Thank you for your feedback! We're very sorry that your tiles tend to sag. Since this isn't usual with the application of our tiles, one of our representatives will reach out to you right away to help discover the cause of the sagging, as well as possible solutions. We look forward to speaking with you soon. Very easy to use. Cuts with scissors and glued up with no problem. Used for a small bathroom, but would be a breeze to install in a large area. Everyone comments how cool it looks it's only been up a short time so I'm not educated on his performance with heating,cooling, humidity etc. Used these ceiling tiles to replace old standard tiles on an existing drop ceiling in the bathroom. The only issue my husband had installing these was getting a snug fit at the edges when he had to make a cut (because of the design). The delivery was quick and the price fantastic. Would definitely order from this site again. Beautiful, easy, fast, and durable! 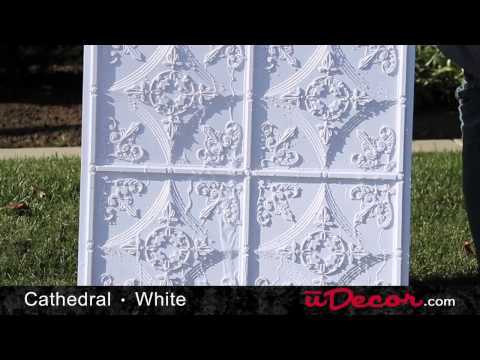 Beautiful panels that are fast and easy to install. Product is durable and easy to clean. The look of the space has improved tremendously! great service, quick delivery, wasn't hard to install. used them on the shower ceiling, had some difficult cuts. just need a sharp pair of heavy scissors, accurate measurements and some clear silicone and you are good to go. This product is easy to work with and it looks great. It is a little thinner than I thought it would be but it still worked wonderfully. The ceiling tile looks great. My problem is that it really didn't go up like I was told it would. By using construction glue, against the sheetrock ceiling, the tiles didn't stay up. Another issue was the 1/2 inch border. It was supposed to be direct mount, but the border looked as though it was for grid mount. Placing them together gave a large space between tiles that really didn't look good, so I had to improvise and overlap where I could. After a lot of adjusting, I had to use a lot of caulk to fill in the spaces. Fortunately it turned out well. At least nobody can see what I see. Lots of positive comments. Our dining room ceiling now has that old Victorian look. What an improvement over the old look. I will be doing more rooms with your tiles. Thank you. Easy to do, doesn't take a whole lot of time and the results are stunning! Everyone who comes in comments about it. An easy, affordable way to upgrade your home. These ceiling tiles are an excellent alternative to real punched or molded tin tiles. Much cheaper in cost when trying to add an elegant touch to a renovation. They look great, installation was - not going to say easy....just installing the tiles - yes, that part was actually easy, cutting them, not so much. We placed a basic grid on the ceiling to start off square. However we have a ceiling fan in center of the room, we felt the first tile needed to be centered under the ceiling fan. Otherwise the entire pattern would seem out of balance. Recommended method of cutting tiles was a pair of scissors. Would not recommend using them since you have a natural tendency to cut at slight angle depending on which hand is dominant, pls with a2 ft square tile, there is a lot of room to wander off straight line. We had better straight lines using box cutter or straight razor utility knife, with a square to guide your cut. The pvc is tough, thin, but tough. Takes some effort to cut, and if you slip without using a square you will ruin a tile. Now the disappointing part, the edges of the tiles are white - which stands out with copper colored tiles. Tiles are thin, but you'd be amazed at how bad the white edges stood out. We used a brown marker to touch up the edges after installation to blend in color. Our office looks amazing. We are 1 tile short, ordering that tomorrow. Since we centered the tiles with the ceiling fan, we ended up having to cut all 4 sides or the room, which lead to is being 1 short. Turned out square - which I was excited, each wall measurement was within 1/8 inch down the wall. I built in bookshelves and used crown moulding so I drove the room square with my carpenter skills. The room/walls/ceiling were not square, but when I installed the bookshelves on 3 walls, I made it square. Overall extremely satisfied with these tiles, I may post a picture once I get finished. We are expecting to do master bedroom in gray/pewter, waiting for a tile to try in the room before purchasing enough to do the room. This product looks great and was easy to install. Fifteen tiles were broken in shipping and because they only cover 23”X23”, I’ll have to order an additional 27 tiles, other than that, no problems. We're very sorry to hear about the broken tiles! One of our friendly reps will be reaching out to you shortly to assist you with your order. We hope you continue to enjoy your new ceiling! Easy to work with. Installed on ceiling over wood stove. Very light. Great substitute for heavy ceramic tile. This is my second purchase. I completed three rooms with my first order which looked so good, I decided to update the rest of my remaining ceiling tiles with more of the same to have one complete look in my basement. It really changes the look of the room. Everyone that has seen the new ceiling, have commented on how nice it looks. Beautiful tin ceiling look at fraction of the cost!! People can't believe these tiles are vinyl until they feel one. Look is so impressive........it makes the room!! Fast service and the tiles are exactly what we hoped for! I've been giving out your name! I have always wanted to do a tin look ceiling in my basement and I chose these tiles because they looked the most authentic . I'm glad I did, I am so pleased with the results and get a lot of compliments on it . Some reviews commented on being flimsy which they are thin, but so far there isn't any sagging. If you use can lights, they have to be supported! For piece of mind I cut 2x2 mdf and put it above the tiles with can lights which seems to work well. Also as the description states, you have to paint your grid work for a more finished look. Another plus to these tiles is you can install gridwork tighter to floor joists because they are thin. Overall wonderful product and I would definitely use again! Product was very thin and moved with airflow. Our first room we did in the antique copper. It looks so nice at a fraction of the cost and weight of metal. We had contractors install the first room, while we are doing the second one ourselves because we aren't doing crown moulding at the top. These are better quality than the similar plastic ones at the big box stores. They don't easily crush or scratch. The only complaint is that there were no installation instructions in the box, so we had to figure it out as we went. To glue them up, you need to use the strongest quick hold/fast grab adhesive, otherwise you'll be holding them up for 20-30 minutes each. Also, my contractors overlapped the tiles at the seams, which I'm not sure if it's right, but it looks good. These tiles are great and they arrived in one piece. I glued them to my ceiling in my kitchen and they look great. Very easy to work with and product was consistent. Product is great. Some basic installation directions would be helpful. Used for headboard. Looks amazing! We used these tiles on a headboard we made. It looks incredible, and they are holding up beautifully. Great product Easy to install !! Excellent product and super customer service!!! I used these in my wine cellar. Finished the perfect look! Easy install and great bang for your buck! Our 1895 home was ready for a kitchen remodel but the plaster ceiling we found above an old drop ceiling was beyond repair. Getting rid of the drop ceiling was at the top of my list. After spending some time looking for a solution that wouldn't break the bank and fit the Victorian feel of the house I found these. I was worried that I would regret not buying tin tiles but when the product arrived I was extremely pleased. They look amazing and were so easy to install. They trim easily and have added so much character to the kitchen. I can't say enough about how great these turned out using our existing ceiling grid. Now my "drop ceiling" is one of my favorite things in the house. We are already deciding which ceiling is next. Great product, great price and fast shipping ! Fairly simple to install. Looks incredible. It is the very first thing our guests see when they come in the house. Everyone's jaw drops. Very pleased. We love the color, ease of using, and how the tiles give our dining room makeover a nice finish. This has changed my whole room! Super classy! Thank you for working with us on this product and the speed required to get the job done. This was a commercial application and the product was great to work with. LOVE these tiles. Great look for a great price. I would recommend these to anyone looking for the tin look without the price. Love the look and price. A few arrived damaged but they immediately sent out replacements. Everyone loves the look and my bathroom looks great. I am very pleased. I am ordering more for my bedroom. Needed to cover up 3 different peeling ceiling surfaces in an upstairs bath. Used with their ACP surface mount grid, well worth it although my project was under 100 sq ft so would vote for being able to purchase individual grid pieces if given that choice. Customer service contacted me multiple ways to recommend color match, wh/ I greatly appreciated and wh/ matched well. Hope it holds up to bath moisture but am confident. Several tiles fell out as I "tipped" the next grid, but only one small corner chipped upon hitting the floor. The tiles were more durable than I'd expected. The ugly ceiling I fought for 15 years is now covered and beautiful. Will use again on upcoming entry project. It's absolutely beautiful. It completely changed the kitchen. We had old well-worn white ceiling tiles and changed to the Antique Bronze tiles. It's well worth the price. I'm so glad we checked you guys out. Thanks. Our ceiling turned out beautiful! Highly recommend this company, we had our order in just a few days! people like it and think it is real metal. Love the look of the tile. Put it in the ceiling over a stone bar we have built with timber beams, corrugated tin walls and a 2 inch pine bar top. The rustic look is awesome and the tile is the finishing touch. Easy to use and a great result. Our high, 13 foot, ceilings distributed the color nicely. Worked well with the border tiles which were used in a few areas besides the border due to vents etc. It really gives a solid old world TIN look. Nothing but raves from everyone who has seen it so far. Will be ordering again for a future upgrade. The customer was very pleased. The ceiling looked great. Customer service was great. Three of the tiles came in cracked, they made them up immediately with no hassle. Great product, easy to handle. The tiles are tough, but easy to cut with stout scissors. They went up easily and covered a really bad looking ceiling. We glued them up with Power Grab adhesive. You would never know they aren't the real deal. A few tutorials might be helpful, especially tips on beginning the layout, and marking the tiles needing cuts. One tip: we used a black marker on the edges to make sure there weren't white edges showing at the seams. These tiles were easy to cut and install and are very beautiful-the all important factor is the glue! It has to grab immediately as gravity is pulling on it. We applied directly to a new, un-painted hardboard ceiling using liquid nails tub surround. Looks amazing! Materials are easy to work with and added a very cool "look" and "texture" to the bathroom ceilings ....The Udecor team was very friendly and helped assist me in the amount of product needed for the job and was spot on with the order...I will definitely be shopping with them again in the future! Product definitely transformed the dining room. A few gliches with tiles being shaded a bit different and some of the packaging resulted in damaged tiles, but all was taken care of and had nothing to do with the quality of the product. I have already recommended your company to 3 other clients looking to give their rooms a new look. We spray painted the grid to match the color of the tiles and it looks great. A few of the tiles had damage on the corners but we used them for the edges and it all worked out fine. We believe the damage occurred when the freight company threw them on the porch and left. We're so glad that your installation turned out great and appreciate your resourcefulness in making use of the damaged tiles for your borders. We are also more than happy to replace tiles that are damaged in shipping. product is exactly as pictured. durable. no disappointments. arrived quickly. Love it! Nothing but compliments. Love it, received lots of compliments. Very reasonably priced! The addition of these tiles has dramatically improved the look of the room. Good product and outstanding service, as well!! Looks absolutely great. Easy installation. Get the boarder to go along with it. Changed the look of the room. Everyone that sees it wants it. Beautiful ceiling at half the price others charge. We used this ceiling in a bathroom and couldn't be more pleased with it. Everybody that uses our bathroom comments on the ceiling. The home improvement places want around double the money for a similar ceiling. This is a beautiful product at a fair price. They obviously operate their business on good principles. If I ever need another ceiling, this is who I will buy it from. Very nice looking, if you have a large area and can use border tiles, probably want to. We didn't since we put in small 7x12 bar area. It still looks nice but you can see edges. Looks amazing and getting tons of compliments! Looks amazing but not perfect for certain grids like metal ones. Unfortunate there was not a specification about different types of grids. We are glad to hear that you are receiving so many compliments on your ceiling The Cathedral should work with any standard sized grid; the material of the grid shouldn't affect the tile. What might affect it is if it is a slimline grid system which is only 9/16" wide (compared to the common 15/16" or 1" grid systems). For slimline grids you need special tiles in order for them to fit properly. Looks like real metal panels. Most people are impressed with the ceiling tile and actually think it is made out of metal. What internet shopping should be. Made the ceiling transform from dull to a custom expesive look. The thickness of the tile is great, very sturdy, great look, we love them. We spend a great deal of time living outdoors here in Phoenix. When it came time for us to remodel our back patio, we wanted to do something different - dress it up a bit. These tiles were perfect. We get so many compliments on them. I've had people think these are real tin! We had to remove glue-on ceiling tiles and they left a mess of adhesive blobs. So we screwed 1/2" wood strips on the ceiling, stapled one edge of the tile to a furring strip and then overlapped the next tile, adhering it with the adhesive suggested. We did not start in center as we wanted only one edge that was cut. Two suggestions: Offer adhesive in the color of the tile. It was a bit of a challenge to keep the adhesive from not squishing onto the next tile. Also, I was a little concerned about the two cut edge sides - whether they would look right, but it turned out fine. We put up a small strip of crown moulding and the edges fell into place against the moulding after a week or so. We did not use the trim moulding (returned it) as we found it wasn't needed for the way we installed the tiles. These were installed in December 2013 and so far so good!! Installed fairly easily, one area that is a problem is the intersecting corners where you get the build up of the thickness of 4 tiles.